Once upon a time I went looking for a new house, trusty "must-haves" list in hand. What did this list include you might ask? Well, all of the things that I NEEDED to have in a new home that I didn't have in my current one of course! On the very top of said list you would have found this : "AMAZINGLY huge master bedroom". Guys... I'm talking like double door opening, chandelier hanging over the bed, fireplace center stage with TV over the top of it, extra special cove section for my cute chairs, windows with light pouring in at every angle kinda big. You know... like Pinterest, DUH! 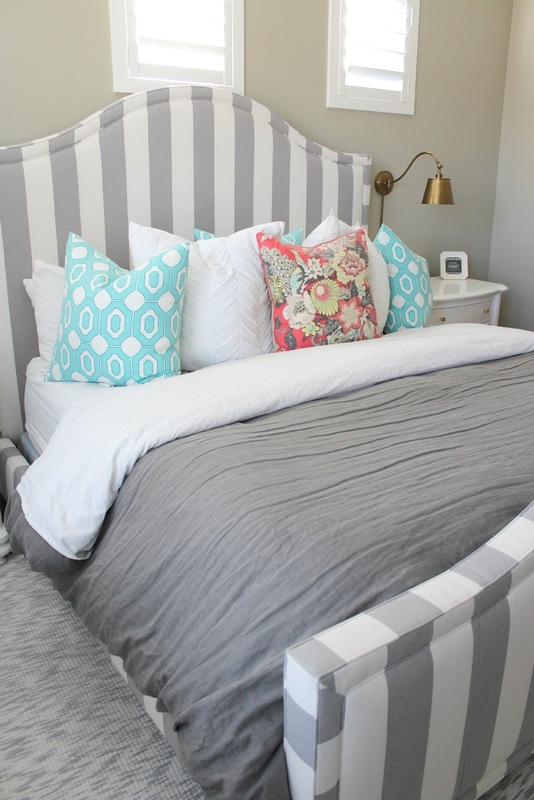 Seriously though, my last bedroom was barely big enough for my bed and nightstands. I wanted something that felt more grand and... Master-ish. It's funny finding out the things you'll compromise on when schools, location and basically everything else trump one or two of the items that you thought were super important on your list of "gotta haves". I knew the second I fell in love with the new house that the size of the master bedroom (even though somewhat disappointing) wasn't going to make or break the deal for me, but there was definitely something in this space that needed changing ASAP... and that was my mattress. I don't know about you, but when I think about the most magical thing that I would like to happen MOST often on MY mattress, it has to do a lot with uninterrupted, amazingly peaceful, recharge every part of your body kind of S.L.E.E.P! A good nights sleep is one of the BEST feelings ever! So when Tuft and Needle happened to email me with an offer asking me to try out their not too soft, not too hard, conveniently delivered right to our door in a few days, take it away for free if we don't like it, highest rated in the whole world mattress... I was like - "Pshhh, well now you made it sound too cool NOT to give it a whirl, so I guess I have to!" Really though, I was super intrigued after visiting their site, reading the truth about how mattresses are made and sifting through almost a hundred reviews. I had to experience this bad boy for myself and see if it would be something I'd recommend to all of YOU. I received the 10 inch king size mattress and holy awesome customer service Batman! Emails and helpful peeps every step of the way with detailed instructions on what to expect and all. And NO... not just because I was reviewing the mattress. These emails go out to each and every customer. I'm not going to lie, the packaging sort of freaked me out at first. 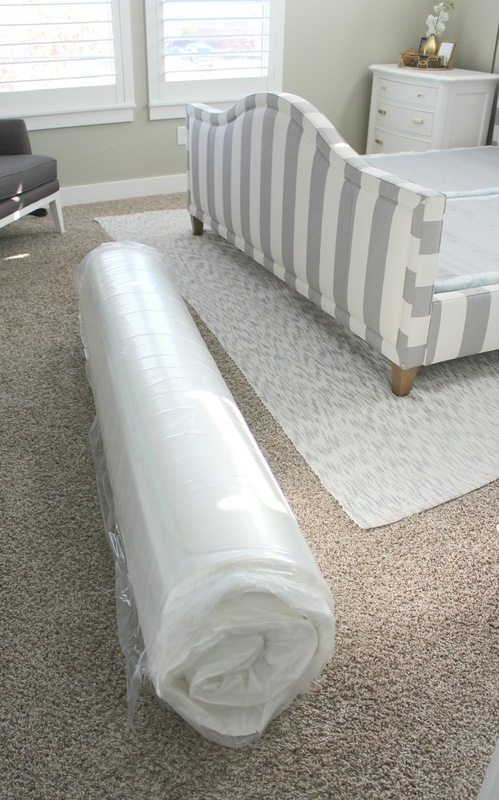 I don't think I've ever seen a rolled up mattress before (have you?). My first thought was - "How great could this bag of air be anyway?" But then I tried picking it up. YIKES! It weighed a ton, and was totally legit. Side Note: This is a team lift type activity - you'll need a helper to move this baby. After hauling it upstairs I put the rolled up mattress on the bed frame and cut it out of the plastic. The picture below was taken after only about 10 minutes. I wish I would have taken another photo after a few hours because I swear the mattress grew another 3 inches or more! Tuft and Needle mattresses are made completely in the USA. The fibers they use are grown and sustainably harvested in America, and the foams used are 100% recyclable. Another huge selling point for this mattress, is the fact that they're ridiculously affordable. The Tuft and Needle mattress for the first week was hard to get used to for a stomach sleeper. Because of how it conforms to your body I felt like the Tuft and Needle mattress made my back arch a little too much, resulting in me feeling like my pillows were too high. (is this making sense?). On my 3rd night I was really frustrated because I felt like I kept having to reposition myself into a different angle before I could comfortably sleep. Nights 4, 5 and 6 were better and then on morning 7 I realized something. It WAS hard for me to fall asleep, but I was WAY more rested than I had been in a long time, and for the first time in, what seemed like forever, my left hip wasn't sore anymore!!! I'm what they like the call a "free fall sleeper". On my stomach, one leg straight, the other one bent, hands around pillow, head to the side and my whole body slightly rocked onto my hip. Apparently this sleeping position means that I'm self-confident, sociable, passionate, sensitive and anxious within... I don't know about all of that (ha!)... but what I DO know, is that after about a week of adjusting to my new Tuft and Needle mattress I was sleeping better than EVER! With my old mattress I would often feel like my hips were sore or achey, probably from not having enough support/cushioning under them, and now, I don't have that problem. One of the really nice things about this mattress I've noticed, is that when your partner moves to adjust themselves, it doesn't move YOU. In our last bed if you flipped or turned the entire mattress would creak and shake. I'm a light sleeper so I'm sure you can imagine how many times this would wake me up throughout the night. Now this being said, you also have to get used to the fact that this bed DOES NOT have springs. Meaning, it will NOT bounce back on you. So when you sit or lay on it for a longer period of time it conforms to you and may take you a second to get yourself up and out of whatever position you were in. I noticed this after sitting straight up against our headboard after something like watching TV or working on my computer. This mattress is clearly more for sleeping than sitting, which only makes sense I guess. ha! In the end, I'd have to say that this new bed was most definitely a win for me. I'm glad I stuck it out that week or so to really get used to it because the long-term benefits of having this much higher quality mattress has really helped me.Ie can fall asleep faster now, feel WAY more rested when I wake up in the morning and don't feel at all sore or achy. 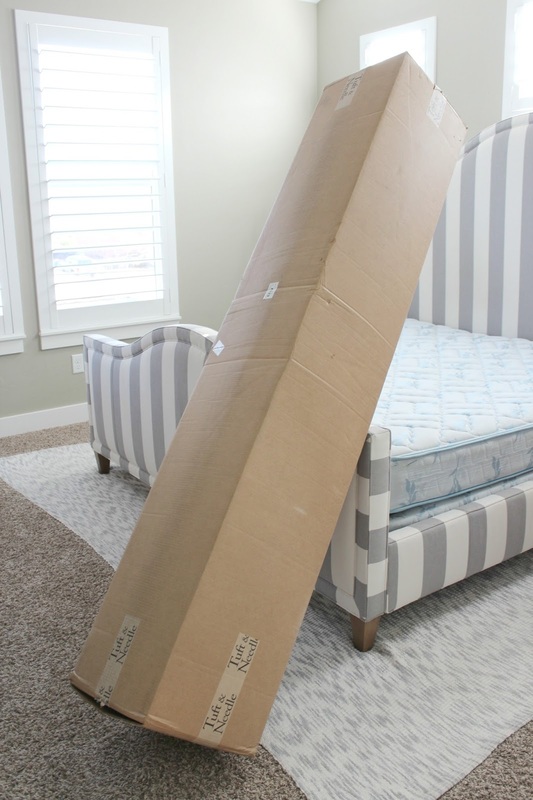 I won't pretend like buying a mattress isn't a super personal, hard decision... because it TOTALLY is, but it most definitely helps when you know you can have something delivered right to your door and also try it without the fear of not being able to return it. 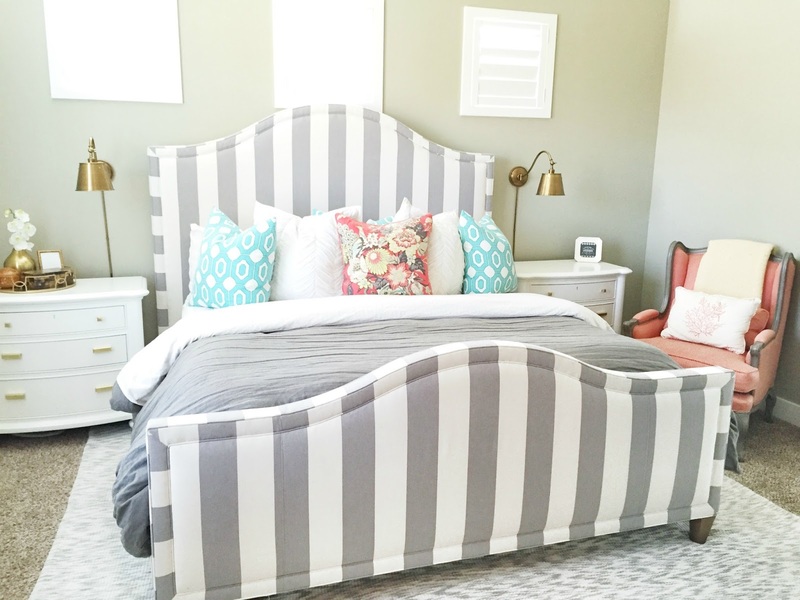 Our friends Brett and Lindsey, and my sister purchased a Tuft and Needle mattress off of our recommendation, and they're loving it as well, so that's two for two! Mostly I just have to emphasize that no matter what kind of mattress size, quality, thickness or brand you go with, just make sure that it's a GREAT one. I spent way too long sleeping on a crappy bed - don't underestimate the power of GOOD sleep. It's amazing how much happier and energetic you feel when you're well rested. My Tuft and Needle mattress was provided free of cost, in exchange for an honest review - all opinions and content are my own. Beautiful room! I looked on the mattress website, the only info I can't find is if the mattress has a removable cover. Since you have the mattress, what do you think? Is it washable in anyway? can do the same with our house! Convinced I need a new bed :( my hips ACHE every morning! Thanks for the review! We too have been "sleeping" on a horrible mattress for years. I'm too worried about spending a ton of money on a mattress I may hate and then be stuck with! My problem is I toss and turn and wake up several times a night. Any of you experience an improvement in that area (if that's even a problem!)? I just want to wake up refreshed and not tired!! Thanks! Thanks for your review...I am considering purchasing this mattress and I am wondering if you can give any feedback on whether or not there was a chemical smell due to offgassing? I am sensitive to memory foam smell and just wondering if this would be similar. Thanks! You have a very pretty bedroom and your new mattress sounds divine!!! Nice! We bought one a lot like that a few years ago and it fixed all my hubby's back problems! Serious elders quorum back problems! Hope it helps you as much. What color are your walls? Super pretty. Where did you get your bed frame? I LOVE it!